20 Weeks - about to go to Ladies' Night! We took a weekend trip down to Austin last weekend, and had a great time. Alan played a couple of church tournament basketball games (they won both, yay! ), and we toured the state capital. Matthew in blue, Adam in red. We are in the Senate Chamber. We took our official 20 week belly picture at the Capital. 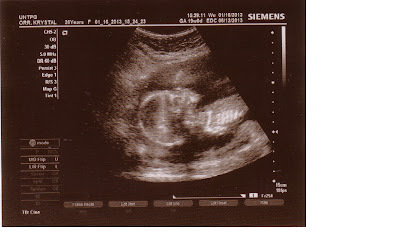 The last few days have gone by soo incredibly slowly as I waited for the day of our ultrasound. Last night I could hardly sleep because of all my excitement and nervousness. I was so worried they would find something wrong with the baby. Then of course I wanted a girl, but didn't want to want a girl too badly, because I didn't want to feel disappointment if it were a healthy baby boy. Basically all the unknowns were driving me crazy! Everything looked great with the baby. She measured exactly 19 weeks, which is what I am today. Heartbeat of 136. Weight; half a pound. I asked the tech how certain he was that it was a girl. He said, "If it's a boy, it has the wrong parts." But I've been thinking a lot about the birth. With the boys I was with a midwife group through a hospital for the first half. When they found out it was twins at 20 weeks though, they kicked me out! I found a doctor, and she did an amazing job taking care of me and delivering my twins vaginally. But I still had an epidural, pitocin to speed up labor, and my water was artifically broken. But there is something I have always wanted to experience. Natural birth. No epidural or IV pain meds. Which means I wouldn't want pitocin (unless absolutely necessary) because of the painful contractions it causes. I wouldn't want continuous monitoring, so I could walk around. Etc, etc. But natural birth has always scared me. It means pain. But also, depending on where you deliver, it could mean nurses talking about you behind your back, which I really didn't want. If I am going to try going natural, I want to be as supported as possible, while still feeling I am not risking the baby's safety at all. I talked to my doctor about giving birth naturally, and she was open to it. But our conversation was very brief, and she said most of her patients choose the epidural. Which is fine, but I wanted someone who had lots of experience without the epidural, because I feel like the skills/knowledge needed by the provider is so different. I also wanted the nurses to be very supportive of the idea too. So, even though I love my doctor, I started researching. I found a hospital with a midwife group that has great reviews. They allow ambulation during labor, intermittent monitoring, and are very natural birth friendly. Then I found out they do water births. Just the thought of laboring in water made a lot of my anxiety about the pain go away. This sounds like the perfect method of natural pain relief to me! I have mixed feelings about giving birth in water. But the more I think about it, the more I like the idea, as long as they monitor the baby's heartrate so I know he/she is not in any distress. I also like the idea of giving birth in a hospital, where all emergency equipment/personnel is right on hand, so I don't have to stress about that. Little update on the boys: Matthew had a fever the last 2 days, and has been very lethargic and cuddly. In some ways it was nice for Mommy. He started getting better around noon yesterday, and he is back to his normal, crazy self today. I felt Adam wasn't 100% before, but no fever. He seems fine today too. It has been a crazy winter today for sickness for a lot of families, so I'm thankful it wasn't more serious. Since it has been in the 80's recently, Alan had to dig out all the winter gear. He couldn't find gloves, so the boys used socks for gloves. The next morning (after I spent the night at the hospital to avoid the icy roads), I got out with the boys, and we built a tiny snowman with the snow that hadn't melted yet. (They decided to take off their gloves towards the end). It was so so cold outside!! And for comparison.. here is the boys first and only snow day before this one. 5 months old. 2-5-11. I haven't written much about my pregnancy with #3 yet. Half the time I forget that I am pregnant, since Adam & Matthew keep me so busy! I feel like this third baby will just be added to the mix, and hopefully that will be a positive thing. I am hoping I will be more laid back and able to enjoy babyhood. I am so looking forward to nursing one baby at a time. Of course I am also nervous about adding a baby to a sometimes already crazy house! On the balcony overlooking the Smokey Mountains in Gatlinburg, TN where we found out. I felt the baby move for the first time at 14 weeks. I know it was the baby, and felt it off and on for the the next few weeks. I am 17 weeks now, and I feel the baby move pretty often. It is so neat :) I can't wait until baby gets a little stronger, and we can start seeing the kicks and feeling them from the outside. We find out the gender in a little over 2 weeks, and we are both so so excited to find out. I think most people know I would love a girl, but we are also okay with a houseful of boys. 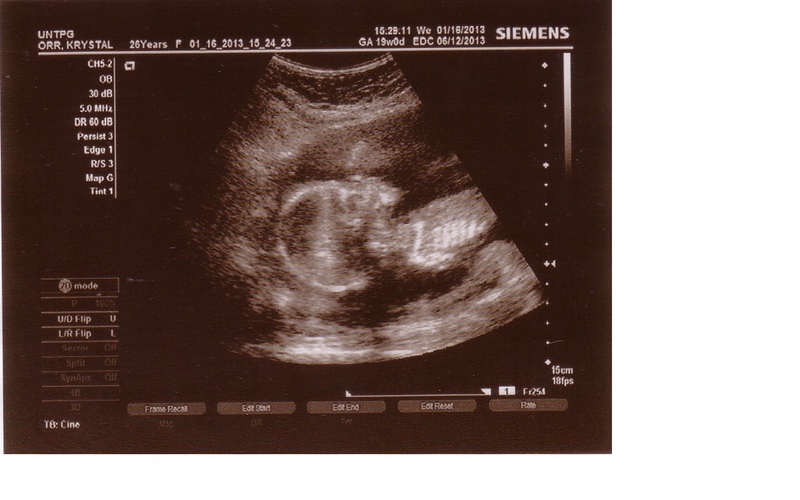 We are done after this one, so this little one will complete our family, no matter what the gender. 16 Weeks - Tiny Bump!